Working Together to Protect Workers' Rights! The Ohio State Council of Machinists (OSCM) is an organization of thirty-two (32) labor unions which represents over 20,000 manufacturing, steel, automotive, aerospace and other workers across the great states of Ohio and West Virginia. 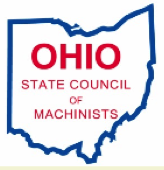 On July 1, 2016 The West Virginia State Council of Machinists was affiliated into The Ohio State Council of Machinists.